What about the girl who decided to stay seated on the bus before Rosa Parks? Her name was Claudette Colvin and hers was the case that many say sparked the subsequent actions that propelled the Civil Rights movement. What do these two people have in common? Plenty. The part that fascinates me is their willingness to do that thing no one else would do but many knew was needed. They have the ability to stand up and stick out, likely enduring some judgment, if not worse. 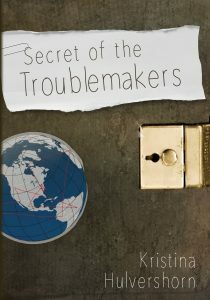 They are ahead of their time and are in a category of their own: troublemakers. These brave and creative folks are who we need to celebrate and allow ourselves to become if we wish to create a more peaceful and equitable world. They are who motivated me to write my first published children’s book: Secret of the Troublemakers. So much of my life and my work runs counter to cultural norms so I know what it feels like to be labeled a troublemaker. Coming up with positive language for youth seeking to make our world a better place was really important to me because these are the acts and the traits we need to amplify, not extinguish. We can call them pioneers or innovators but that doesn’t capture the risk or disapproval they endure. When you seek to upend unjust systems, you’re not often showered with praise. You’re viewed with skepticism and your ideas are countered with fear or condescension. This is a world I know too well. I wanted to give my youthful allies a new frame and a new way to view themselves. I wanted to give them the gift of confidence and the self-love they deserve. Without spoiling too much for potential readers, this book lets kids in on a well-kept secret that can help them unlock their full potential as changemakers! It’s also not just for kids. I’ll admit that every time I re-read it, I get a little electrified and reinvigorated to make some good trouble. I hope you’ll check it out!